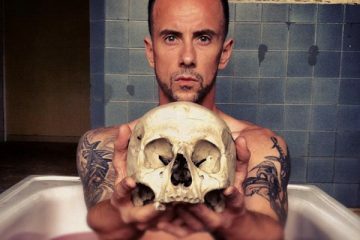 Guitarist/vocalist Adam “Nergal” Darski of Polish extreme metallers BEHEMOTH is putting the finishing touches on his autobiography, “Sacrum Profanum”, for an October release. The book, whicih was previously described by Nergal as “a really long in-depth interview,” will initially only be made available in Polish, but “depending on interest, we might be translating this into English,” he says. The “Sacrum Profanum” cover photo was taken by Ivo Ledwozyw, with post-production by Seth Siro Anton (PARADISE LOST, KAMELOT, MOONSPELL, SOILWORK, EXODUS, JOB FOR A COWBOY, DECAPITATED, VADER). 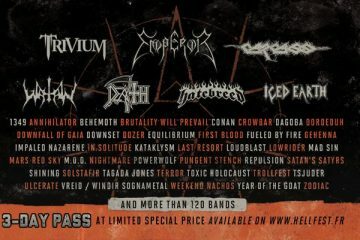 In addition to publishing the book, Nergal will be working with Polish producers Grupa 13, with whom he had previously collaborated on the BEHEMOTH videos “At The Left Hand Ov God” and “Ov Fire And The Void”, on several promotional clips. In December 2010, Darski underwent a bone marrow transplant procedure after being diagnosed with a life-threatening form of leukemia. 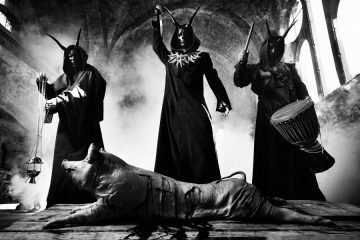 In a recent interview with Turbo from RSU Radio and the Metal Meltdown, Darski was asked how long fans will have to wait for a new BEHEMOTH studio album. “I’ve got plenty of stuff written down — not completely finished lyrics, but a lot of ideas and verses here and there and some choruses here and there,” Nergal replied. “It’s a slow process. I’m screwing around with some riffs here and there at the backstage of the venue or the back lounge [of the bus], I’m just jamming out. I think there’s plenty of ideas, but sometimes it takes me weeks to realize or to come up with something that I consider, myself, ‘Wow, this is it. This is the stuff that should be on the next BEHEMOTH record.’ It looks like, with the tenth record, it’s worse and worse for me to come up with something I will feel that is great.